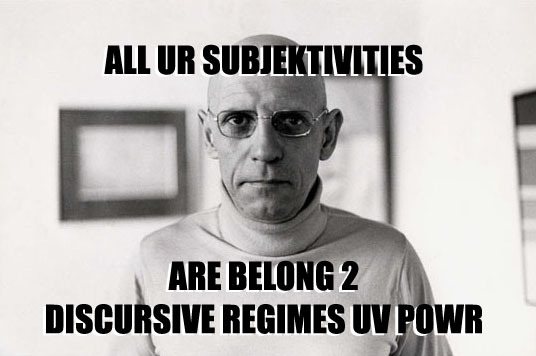 I think it’s safe to say that, were he alive today, Foucault would have a lot to say about the internet and it’s role in discursive subject-formation in Western society. Not only has the digital age ushered in a whole host of social norms and obligations that influence human behavior (putting the internet itself on the level of regulatory institutional power structure), network technology also complicates the deployment of power through its capacity as a non-linear, interactive platform for discourse and through its conflation of the public and private realms. Paradoxically all-invasive and elusive, ever-present while simultaneously disruptive of time and trajectory, the internet enables a unique ontological engagement with the world around us that has implications for both strategies of regulation as well as tactics of resistance. Although this line of thinking and the contemporization of Foucauldian thought could be applied to any number of power relations currently mediated through network technology, I am particularly interested in computer-mediated social interaction and the effects that this may have on self-understanding and self-knowledge. In my next two blog posts, I would like to relate Foucault’s ideas of surveillance and self care to the digital presentation of self on sites like Facebook and Myspace in an effort to begin to understand the ways in which network technology may impact subject-formation and the personal negotiation of identity. First of all, I think that there is an interesting connection between Foucault’s idea of self-surveillance—his panopticon—and the curation of one’s identity online. The basic idea behind Foucault’s metaphor of the panopticon is that we have all internalized methods of regulatory discipline and that we orient ourselves in accordance with structures of regulation based on these internalized ideals rather than a real threat of external discipline. In other words, one way that discourse regulates human behavior is in the way that it becomes a part of our everyday thoughts. The effects of power-knowledge on our lives then manifest themselves through not only our own choices of ways in which to behave, but also our internalized value judgements about different ways of behaving. I like to think of this as that “little voice” in our heads, telling us what is right and wrong in any given instance. What is interesting with websites like Facebook is that there is a physical manifestation and a trace of the effects of this “little voice.” We curate our online personas based on an internalized idea of what we should or should not do—who we should or should not be and then we essentially build a visible archive of those decisions. As an extension of the connection between online profiles and Foucault’s panopticon, I tend to think that when we groom our social personas we are usually doing so for an imagined audience. We not only are engaging with an idea of who we are and who we would like to be, but we are engaging with ideas of who might view our profile and an internalized idea of how we imagine or desire that viewer will engage with the content that we present. Therefore, we not only want to appear in a certain way, but we are also building on concepts of who our audience is. Now, where this gets a little bit messy and interesting is when you think about the temporality of all of this. People don’t really create their entire Facebook profile all at once, rather it’s a process of accumulation and a space of negotiation. It’s something that we sometimes are deliberate about and other times whimsical about. Our ideas of imagined audience are constantly shifting, and they are often in chorus with any number of real or imagined social dynamics that we may be currently experiencing. Because of this, I think that visual representations of self via sites like Facebook can be incredibly informative about the panopticon-like structures of self-regulation operating in our lives at any given moment. A conscious reflection on the decisions we make while constructing and grooming our self-representation online could therefore function as a productive mode of investigating and challenging our own internalized regulatory notions of identity. In my next blog digitizing Foucault, I will extend this discussion to ways in which online profiles could possibly function as a technology of self through which we Lose Weight Exercise self-care(a highly personal self-reflective process by which we form our own ethical self-understanding), which Foucault cites as a means to practice freedom. Ideology – I haz it.